We have a SPECIAL PRE SEASON OFFER! The Meyer Drive Pro plow. Now you can get a STEEL BLADE for many SUV's and smaller trucks that could never carry a steel blade before. Times are tough, why throw money away paying someone to plow your driveway when you can do it yourself! Keep in mind that we can still order ALL plows at 2007-2008 pricing only until August 31, 2008. After that who knows, considering raw steel prices have doubled since December 2007, and just last week freight charges increased 50% over last year! 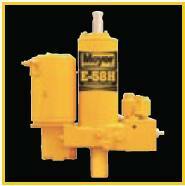 Includes E-58H COMMERCIAL PUMP, Nite Saber Lights, and Touch Pad controller. 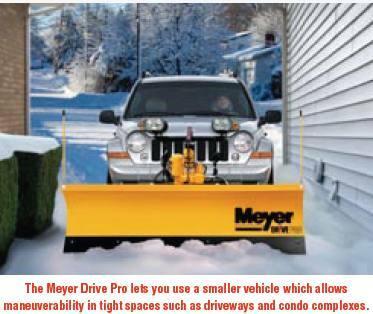 The Meyer Drive Pro Snow Plow is not some piece of plastic with a plastic cutting edge and rubber bands on it! It is a Commercial Grade Plow with a steel moldboard and steel cutting edge that carries Meyer's ROC Solid Warranty! That is, after purchase, you register your Warranty on the internet, and you have a FULL 3 YEAR Warranty on EVERYTHING, and a 5 YEAR Warranty on all black Iron Parts! NO Other plow manufacturer offers a Warranty that even comes close to this! Click here for Warranty Details. The above tools are currently for sale in our eBay store, and/or up for auction. 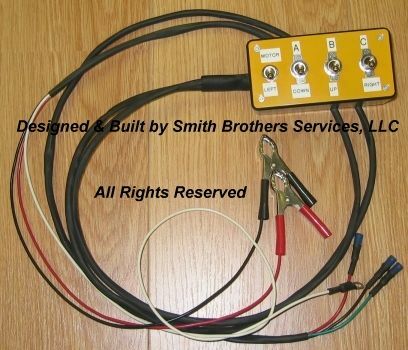 The Diagnostic Control Box is a one of a kind tool we invented in our shop. It gives you more control over functions when testing Meyer E-47, E-57, and E-60 Plow Pumps that use a single wire on each of the coils (Red, Black, and Green). There is no tool like it on the market that we know of. We use it in our shop, in fact we have an identical one on our test stand that we used to test pumps before and after rebuilding. We will also be offering adapters to use this Diagnostic Tool with the Meyer E-58 Snow Plow Pumps that have 2 wires going to each coil. Smith Brothers Services, LLC is dedicated to bringing the industry unique useful products that cannot be found anywhere else, or with features that cannot be found anywhere else. The pressure gauge we use to check pump output pressure while the unit is still mounted on the vehicle. 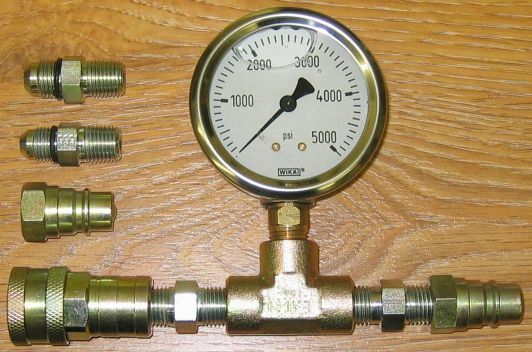 It is also what we use to check Crossover Relief Valve settings. 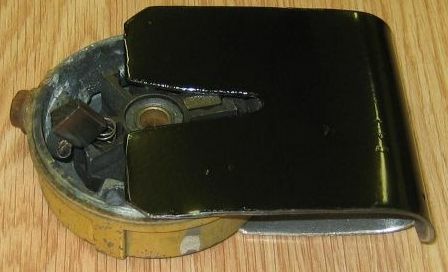 The last two photos are a tool used to hold the brushes in the motor cap when installing it on Meyer E-47 Snow Plow Pumps. Makes it a snap to install the cap. Forget other tools that still require two hands to hold the brushes in place, this is the easiest way we have found to hold the brushes in place and install the cap. For the 2007 - 2008 Season we will be offering a limited number of Rental Units. Check out our Web Log to see what we have been up to! We are an Authorized Fluid Film Dealer. Fluid Film has literally hundreds of uses.